Don’t let your disability get in the way of keeping up with training. Carolina helps her clients meet their goals with a uniquely designed fitness program tailored to fit each person’s needs. Whether you are in a wheelchair, suffering from a sports injury, work injury or have a disability that limits your capacity to exercise, Carolina will help you meet your wellness goals. She understands that it is difficult taking care of your physical fitness when you have a disability. 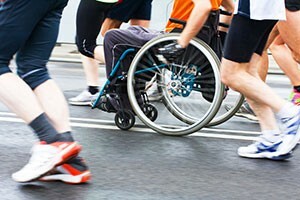 Exercise is especially important for people with disabilities. It helps to maintain your body strength, keeps up your energy, and reduces stress and fatigue. Carolina always finds the appropriate exercise for each situation. Athletes often worry that when they have an injury it will cause them to lose fitness during recovery. Carolina Personal Trainer will modify a fitness routine to support your body during recovery from any sports injury. Even if a body part or joint is immobilized, there are other ways to stay fit while in rehab. She has the knowledge to continue your athletic training at a modified level while you heal. Most athletes find training through injury is a possibility and not too strenuous. Carolina will help you maintain an excellent attitude and protect your injury until it heals. A work-related injury such as back, neck, or knee pain can set you back when it comes to your fitness. When you are injured it is easy to gain weight, lose muscle tone and strength, plus you get out of the habit of joining healthy, physical activities when you are hurt or battling a chronic issue. Carolina is highly trained and will help keep you on the right physical fitness track while you recover from your work injury. Carolina stresses the importance on keeping up on physical fitness and pushes you to your limits in order to greatly improve your situation. Carolina believes injuries, illnesses, and chronic problems are obstacles, but they are not impossible to overcome. Call Carolina Personal Trainer today so you can get back into shape and live a full, active life.